One of the benefits that SharePoint provides is the ability to ‘tag’ information using metadata. This can greatly reduce the structure you use, especially when it comes to documents. Thus, instead of creating a deep and complex folder structure you use metadata to tag the files into the same categories as you would typically use for folders. Doing so make navigation and searching much easier. The easiest way to achieve this to simply add a column to the location in a SharePoint site as the above video of mine demonstrates. The draw back to this is that column is only available in that SharePoint item, it can’t be used in other lists and libraries. 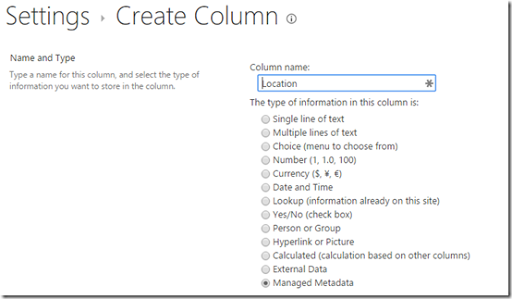 The next option is to create a Site Column, which is exactly the same as an individual list column EXCEPT it can be used anywhere throughout the whole SharePoint site. I’ll cover that in another blog because I want to focus on a solution that is even more available and powerful than Site Columns. 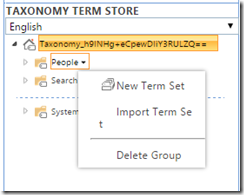 The Term Store provides you the ability to have nested metadata fields across every SharePoint Site you are using. As you can see from the above screen shot, the Term Store is not just a one dimensional list like an added column is, it is hierarchical. You get to the Term Store but logging into the Office 365 web portal as an administrator and then navigating to the SharePoint admin center. Then, from the menu on the left, you should see a option term store. When you select that, you should see the screen shown above. Like many things in Office 365 no user has the ability to edit the Term Store, so the first thing you need to do is add your user details to the Term Store Administrators box in the lower right of the screen and save the changes. If you don’t do that then you won’t be able to edit or add to the Term Store. You know you are able to do this when you hover over an entry and a small down arrow appears to the right. Selecting that arrow will then reveal a menu like that shown above. The example that I’ll user here is creating a standard taxonomy (i.e. metadata structure) to cover locations (i.e. countries, states, cities, etc). 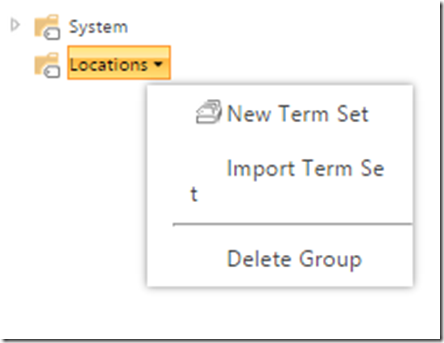 At the very top level of your Term Store, select the down arrow and from the menu that appears select New Group. That will create a folder at the bottom of your. In this case give it the name, Locations. Select the arrow to the right of this and then New Term Set from the menu that is displayed as shown above. In this case I will call the New Term Store Country. Keep repeating this process to build out the taxonomy (i.e. tagging structure you desire). Now go into a item in SharePoint, in this case a Document Library. Add a column and when asked for the Column type select Managed Metadata at the bottom of the list of options, as shown above. Scroll down the page and locate the Term Set Settings area. You should now see the hierarchy you saw in the SharePoint admin center. You can now expand the structure and locate the term to select the place to start the selections for that field from. 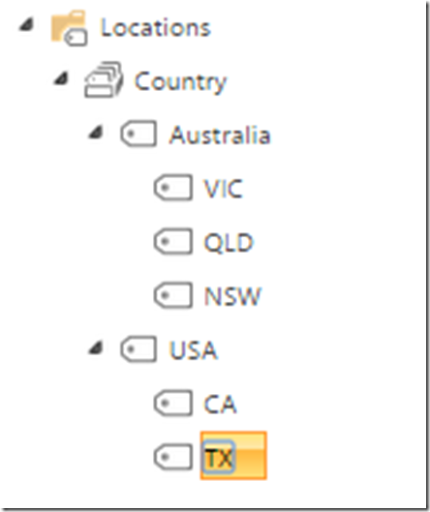 Here I have selected Australia so I get all the states below this only. Now if you edit the properties of an item in that list you will see the new field and a tag icon to the right indicating that it is using managed metadata. This is where it gets cool. If I type n.s.w. in it gets rejected. Although n.s.w. is ‘correct’ as value for the state it isn’t in the format we defined in our taxonomy, so it is unacceptable. 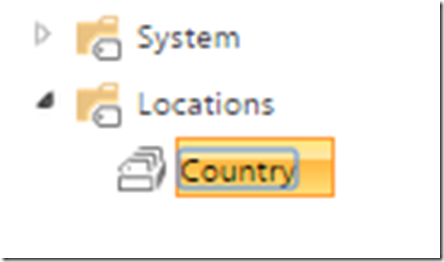 This can ensure that the data that is entered into SharePoint is consistent. If I however start typing the name of a state I am automatically prompted with the correct value. I just need to click on the suggested entry to complete. Alternatively, if I select the two tags to the right of the selection field I am given a view of my hierarchy from the initial location I selected previously when creating the column. Again, all I need to is select the option I want from the list. Now you’ll see the file has been tagged appropriately for with a location as shown above. 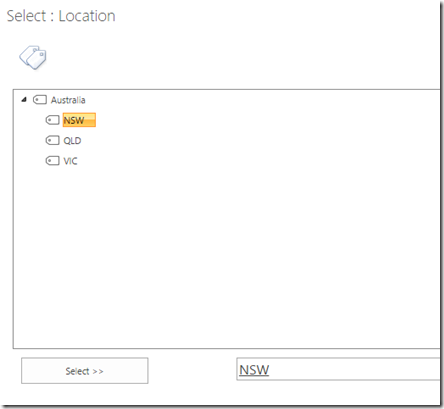 I can sort and filter as I normally would on this field inside the SharePoint list. 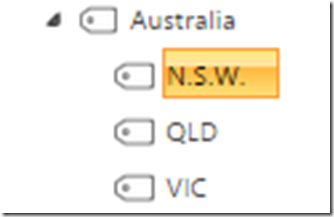 If I now for example change the term from NSW to N.S.W. I see the term has also changed for that document. 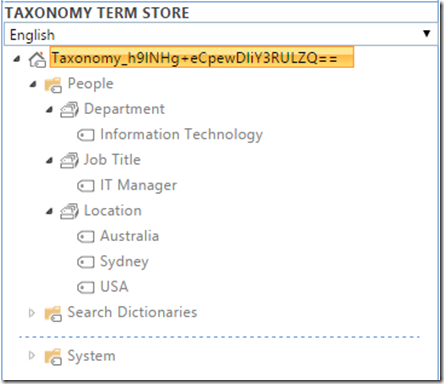 Hopefully this article gives you some idea of the power of the SharePoint Term Store and managed metadata. 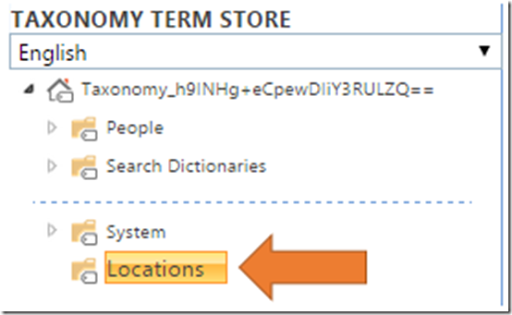 There is so much more you can do with the Term Store than I have been able to show here, so I encourage you to go and do some exploring and see how the Term Store can be used to create flatter and more organised structures in your SharePoint Online environment.